Cream of coconut is made from fresh coconuts. Cream of coconut milk isn't synonymous with coconut milk, but they're commonly confused. Drink recipes often call for cream of coconut because of its smooth, fresh taste. While it's often found in liquor stores, cream of coconut is sometimes carried by grocery stores. If you cannot find cream of coconut you can still make a drink or recipe with that distinct coconut flavor. Coconut milk is not made from the fresh liquid of a coconut; instead it is made from the flesh of the coconut pressed with cream. It yields a creamy, rich coconut-flavored liquid that can be used in drinks, curries and sauces. Canned coconut is available in the Asian food section of your grocery store. Use 1 cup of the top layer of canned coconut milk for every 1 cup of cream of coconut. Get the top layer by opening the can -- without shaking or stirring it -- and scooping 1 cup of liquid from the top of the can. You should see a fat, milky layer sitting at the top of the can. Coconut extract gives a powerful coconut flavor that can be used in place of cream of coconut, but it cannot be used alone. To get the same creamy, thick coconut flavor you need to mix a can of sweetened condensed milk with enough coconut extract to taste. Use this mixture in equal portions to the amount of cream of coconut called for in the recipe. Coconut cream powder is made from freshly prepared, then dried coconut cream. Coconut cream powder can be reconstituted with water or heavy cream. To use in recipes and drinks that require cream of coconut, use 1 cup heavy whipping cream and a 1/2 cup of coconut cream powder for every 1 cup of coconut cream required in the recipe. To evenly mix the powder blend the heavy cream and powder or place the two ingredients in a jar and shake. 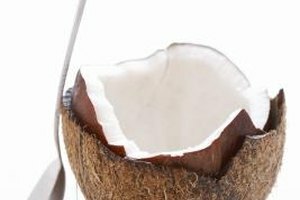 Make your own cream of coconut at home using freshly grated coconut flesh, coconut water and heavy cream. Mix the three ingredients into a saucepan and bring to a boil for about 5 minutes. Then remove it from the heat, cover and allow it to cool. Strain the mixture using a fine sieve or a few layers of cheesecloth. Refrigerate unused cream of coconut for 2 to 4 days and use homemade in equal portions to canned cream of coconut. How Many Calories Are in Cream of Wheat?